The trend to implement Performance-based Incentives (PBI) in low- and middle-income countries to strengthen health systems, accelerate service utilization, and enhance quality of health interventions presents an opportunity as well as a challenge for voluntary family planning (FP) service delivery and use. 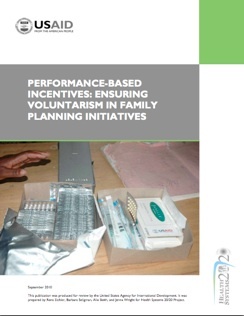 There is considerable opportunity, through performance-based incentives, to stimulate quality FP counseling and increase access to and availability of voluntary family planning. At the same time, the challenge of introducing incentives that support informed voluntary choice requires careful design and ongoing monitoring. This tension should not cause policymakers to shy away from incorporating FP into PBI schemes, as there is a real danger that excluding FP from these schemes may result in its neglect. Given the central role FP plays in attainment of the Millennium Development Goals, appropriate mechanisms to incorporate FP into PBI approaches are needed. This paper identifies the opportunities as well as the challenges of incorporating FP into PBI approaches; discusses U.S. policies and support for enhancing access to FP; presents what is known about how low- and middle-income countries are including FP in PBI approaches and lessons learned; and provides suggestions for donors, policymakers, program implementers, and technical assistance providers about how to responsibly and effectively integrate FP into PBI programs in the developing world. In 1997, the Egyptian Ministry of Health and Population (MOHP) embarked upon a reform program to restructure and reengineer the health sector with the goal of increasing health insurance coverage and access to high-quality health services, and improving health outcomes. 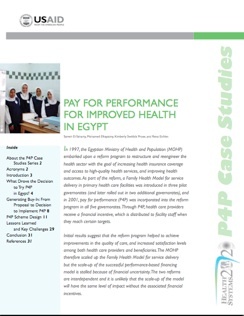 As part of the reform, a Family Health Model for service delivery in primary health care facilities was introduced in three pilot governorates (and later rolled out in two additional governorates), and in 2001, pay for performance (P4P) was incorporated into the reform program in all five governorates. Through P4P, health care providers receive a financial incentive, which is distributed to facility staff when they reach certain targets. Initial results suggest that the reform program helped to achieve improvements in the quality of care, and increased satisfaction levels among both health care providers and beneficiaries. The MOHP therefore scaled up the Family Health Model for service delivery but the scale-up of the successful performance-based financing model is stalled because of financial uncertainty. The two reforms are interdependent and it is unlikely that the scale-up of the model will have the same level of impact without the associated financial incentives. 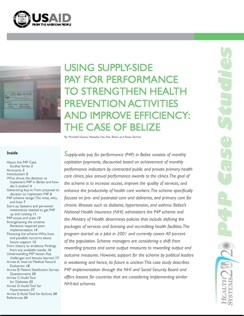 Supply-side pay for performance (P4P) in Belize consists of monthly capitation payments, discounted based on achievement of monthly performance indicators by contracted public and private primary health care clinics, plus annual performance awards to the clinics. The goal of the scheme is to increase access, improve the quality of services, and enhance the productivity of health care workers. The scheme specifically focuses on pre- and postnatal care and deliveries, and primary care for chronic illnesses such as diabetes, hypertension, and asthma. Belize’s National Health Insurance (NHI) administers the P4P scheme and the Ministry of Health determines policies that include defining the packages of services and licensing and accrediting health facilities. The program started as a pilot in 2001 and currently covers 40 percent of the population. Scheme managers are considering a shift from rewarding process and some output measures to rewarding output and outcome measures. However, support for the scheme by political leaders is weakening and hence, its future is unclear. This case study describes P4P implementation through the NHI and Social Security Board and offers lessons for countries that are considering implementing similar NHI-led schemes. 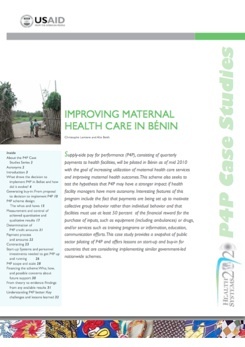 Supply-side pay for performance (P4P), consisting of quarterly payments to health facilities, will be piloted in Bénin as of mid 2010 with the goal of increasing utilization of maternal health care services and improving maternal health outcomes. This scheme also seeks to test the hypothesis that P4P may have a stronger impact if health facility managers have more autonomy. Interesting features of this program include the fact that payments are being set up to motivate collective group behavior rather than individual behavior and that facilities must use at least 50 percent of the financial reward for the purchase of inputs, such as equipment (including ambulances) or drugs, and/or services such as training programs or information, education, communication efforts. This case study provides a snapshot of public sector piloting of P4P and offers lessons on start-up and buy-in for countries that are considering implementing similar government-led nationwide schemes. 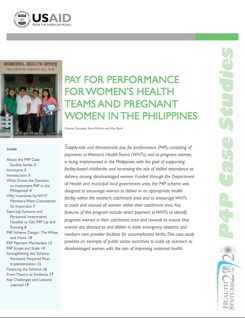 Supply-side and demand-side pay for performance (P4P), consisting of payments to Women’s Health Teams (WHTs) and to pregnant women, is being implemented in the Philippines with the goal of supporting facility-based childbirths and increasing the role of skilled attendance at delivery among disadvantaged women. Funded through the Department of Health and municipal local government units, the P4P scheme was designed to encourage women to deliver in an appropriate health facility within the mother’s catchment area and to encourage WHTs to track and counsel all women within their catchment area. Key features of this program include direct payment to WHTs to identify pregnant women in their catchment area and rewards to ensure that women are directed to and deliver in basic emergency obstetric and newborn care provider facilities for uncomplicated births. This case study provides an example of public sector incentives to scale up outreach to disadvantaged women with the aim of improving maternal health. Pay for performance (P4P) in Pakistan consists of supply-side payments to providers and demand-side vouchers that subsidize the costs of a package of reproductive health care services and transportation for poor women. The aim is to reduce maternal and infant mortality by increasing utilization of antenatal care, skilled delivery, and postnatal care, as well as family planning services. P4P is being implemented within the framework of a social franchise network, Greenstar Social Marketing. Key features of this program include: strategies to reach women who have not previously delivered babies in health facilities and accreditation and training for private provider members of a social franchise network. This case study thus describes an example of a private sector P4P voucher program targeting reproductive health and offers lessons for countries that are considering implementing similar schemes. To increase utilization of health services and improve maternal and child health outcomes, Burundi is in the process of rolling out a publicly funded supply-side pay-for-performance (P4P) program nationwide consisting of payments to health facilities. Interesting features of this program include use of monthly quantity-related incentive payments (based on service utilization) and quarterly quality-related payments (measured partially through patient and community satisfaction) and a degree of facility-level autonomy to determine what to invest in and how to share payments among staff. 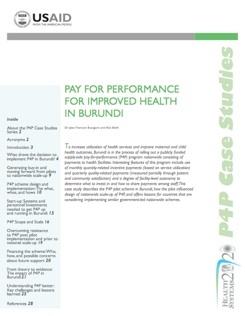 This case study describes the P4P pilot scheme in Burundi, how the pilot influenced design of nationwide scale-up of P4P, and offers lessons for countries that are considering implementing similar government-led nationwide schemes. 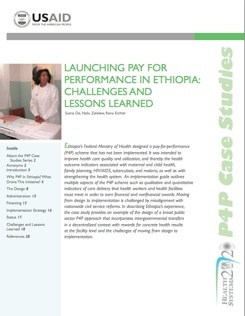 Ethiopia’s Federal Ministry of Health designed a pay-for-performance (P4P) scheme that has not been implemented. It was intended to improve health care quality and utilization, and thereby the health outcome indicators associated with maternal and child health, family planning, HIV/AIDS, tuberculosis, and malaria, as well as with strengthening the health system. An implementation guide outlines multiple aspects of the P4P scheme such as qualitative and quantitative indicators of care delivery that health workers and health facilities must meet in order to earn financial and nonfinancial awards. Moving from design to implementation is challenged by misalignment with nationwide civil service reforms. 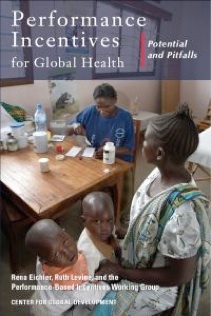 In describing Ethiopia’s experience, the case study provides an example of the design of a broad public sector P4P approach that incorporates intergovernmental transfers in a decentralized context with rewards for concrete health results at the facility level and the challenges of moving from design to implementation. 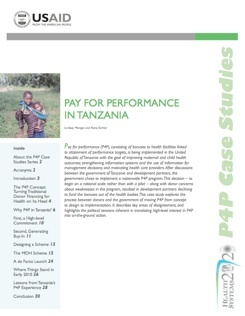 Pay for performance (P4P), consisting of bonuses to health facilities linked to attainment of performance targets, is being implemented in the United Republic of Tanzania with the goal of improving maternal and child health outcomes; strengthening information systems and the use of information for management decisions; and motivating health care providers. After discussions between the government of Tanzania and development partners, the government chose to implement a nationwide P4P program. This decision – to begin on a national scale rather than with a pilot – along with donor concerns about weaknesses in the program, resulted in development partners declining to fund the bonuses out of the health basket. This case study explores the process between donors and the government of moving P4P from concept to design to implementation. It describes key areas of disagreement, and highlights the political tensions inherent in translating high-level interest in P4P into on-the-ground action. In Part I of this volume, Eichler and Levine describe the rationale for offering incentives for the attainment of health-related goals, and they provide clear guidance about how to design, implement, and evaluate such programs, whether they target healthcare providers, patients, or both. Part II comprises a set of case studies that examine the use of such incentives to address a range of health conditions and system performance challenges in diverse countries. Performance Incentives for Global Health: Potential and Pitfalls will help interested policymakers and program managers in developing countries and in the donor community improve health care systems through the strategic use of performance incentives.